The Millennium Challenge Account-Jordan (MCA-Jordan) has handed over another 77 km of new sewage lines to the Jordan Water Company – Miyahuna/Zarqa. With this third batch, MCA-Jordan has completed 220 km out of the 300 km of sewage lines that the company is implementing as part of Wastewater Network Project, which is funded the by US Government’s Millennium Challenge Corporation (MCC). “The fully completed sewage lines that were handed over today to Jordan Water Company – Miyahuna/Zarqa are expected to benefit approximately 105,000 individuals,” MCA-Jordan CEO Eng. Kamal Zoubi said. When the entire Wastewater Network Project is completed in 2016, around 126 thousand individuals in Zarqa Governorate will have the opportunity to connect to new lateral sewer lines. These works, designed to dramatically reduce sewage overflows and increase collection of wastewater, are funded by the US Government as part of the $275 million Millennium Challenge Compact grant to Jordan. 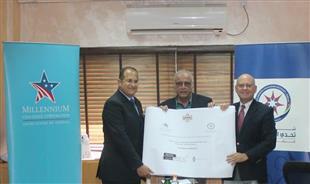 The MCC funded Wastewater Network Project aims to increase the sewage service in Zarqa Governorate from 72% to 82%. This will empower citizens to avoid the health risks associated with using cesspits in addition to dropping the costs required to dig and pump out those cesspits. The company has advertised in the local press the names of beneficiaries of this new network, encouraging them to contact WAJ to start the linkage procedures for the new networks, emphasizing the importance of these new networks in improving the environmental situation and public health of the citizens, giving them a deadline of three months to start the linking progress before taking any legal actions. 1.Water System Project which includes the extension of 800 km of new pipelines along with 50,000 new water meter and a new Al Basateen pump and tank station to reduce water leakage, and aimed water project to reduce wastage of 50% of the amount –to 35% and increase the rate of water supply to citizens from 36 hours to 72 hours per week. MCA-Jordan has been able to implement approximately 98% of the project until this moment. 2.Wastewater network project, which includes the extension of 300 km of wastewater pipes in Zarqa Governorate. Extending wastewater sewer systems will dramatically reduce sewage overflows into city streets and improve the living and business environment. Adding to that increase the beneficiary areas of the wastewater network will from 72% to 82 %. The company was able to implement 96% of the project to this day. The MCC funded projects formulate a complete water cycle for Jordan; the Water Network Project will increase the supply of water to the citizens of the Zarqa Governorate, the used wastewater is then channelled through the expanded Wastewater Network Project, and finally, the wastewater is treated through the As-Samra plant providing more water for reuse and irrigation in the Jordan Valley.